Northwestern first baseman Willie Bourbon and Belmont baserunner Ben Kocher stretch to tag the base first. Kocher’s Bruins took two of three games from the Wildcats in the weekend series. 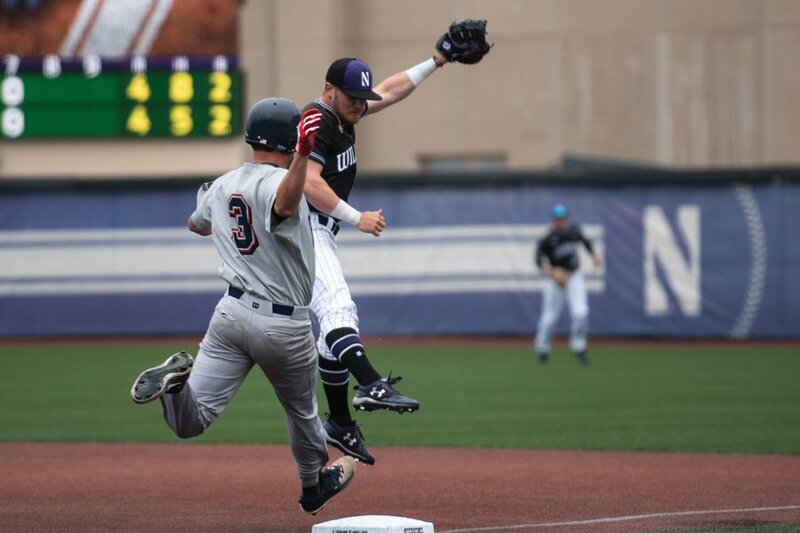 In the bottom of the 10th inning Saturday, senior Connor Lind stepped up to the plate with a chance to cap off his Northwestern career in incredible fashion. Belmont and the Wildcats were tied at 5 with one out, and sophomore second baseman Alex Erro stood at second base as the potential game-winning run. After the count was worked to 1-2, Lind crushed a pitch deep into left field. Thirteen months ago, Lind hit a walk-off home run over that same left-field wall against Air Force. But on Saturday, Lind’s fly ball stayed inside the confines of Miller Park and was caught on the edge of the warning track. The Bruins (19-36, 11-19 OVC) left the 10th unscathed and then, behind Matt Cogen’s third home run of the series, won the game 7-5 in the 11th inning and the series over NU (17-32, 6-18 Big Ten). The Cats held a two-run lead for a majority of the game, after taking a 5-3 lead with a four-run third inning. However, an error in the ninth opened the door for a Belmont comeback. The Bruins took advantage as two runners scored in the inning to send the game to extras. Friday’s game was also an extra-inning victory for Belmont. The Bruins had claimed a 5-4 lead in the eighth, but NU put together a comeback of its own in the ninth. After junior center fielder Ben Dickey singled and advanced to second on a heads-up baserunning play, freshman right fielder Casey O’Laughlin singled home Dickey. The Bruins immediately countered by scoring one run in the top of the 10th. The Cats managed to get the game-tying and the game-winning runs on base, but they were left stranded there as Belmont won the game 6-5. On Thursday, NU’s offense started off hot with five runs in the first inning and did not slow down as they won 13-4. Five players — Dickey, Erro, junior first baseman Willie Bourbon, sophomore left fielder Leo Kaplan and sophomore Charlie Maxwell — collected two hits while senior catcher Jack Claeys finished a home run away from the cycle in the contest. Over the course of the series, the Cats’ pitching staff was solid. Freshman lefty Quinn Lavelle scattered seven hits over seven innings of work Friday while sophomore righty Hank Christie gave up only 2 earned runs in 6.1 innings Saturday. The most impressive performance of the weekend on the mound came from senior southpaw Richard Fordon. Fordon entered Saturday’s game with two out in the fourth and left the game in the ninth inning after pitching a career-high 5.1 innings and giving up no earned runs. All six seniors played over the weekend. Claeys and Lind started all three games and combined to reach base 10 times. Right-handed pitcher Tommy Bordignon threw 2.2 innings during Saturday’s game and struck out three batters. J.R. Reimer and Mat Jones both got two plate appearances over the three-game stretch. For Claeys, while the weekend did not go the way he hoped it would, he said he enjoyed the opportunity to play with his teammates and watch his fellow seniors compete one last time.